This strategy classic returns in time for the franchises‘ 15th birthday. We can’t hide our excitement about this title, as it will take over the PlayStation 4 and Nintendo Switch. 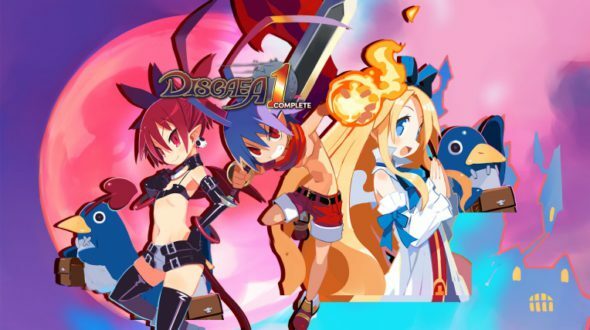 Disgaea 1 Complete is a remaster of Disgaea: Hour of Darkness and will not disappoint you with its upgraded graphics and more. This turn-based game made us hunkering for more, even after all those years. Step into the life of Laharl, the demon prince who needs to fight to reclaim his throne after the death of his father. 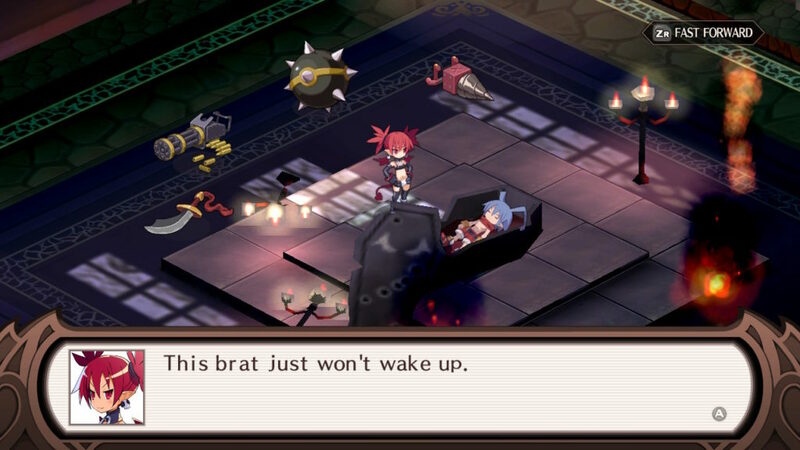 Disgaea takes place in the Netherworld, a world ruled by Demons. 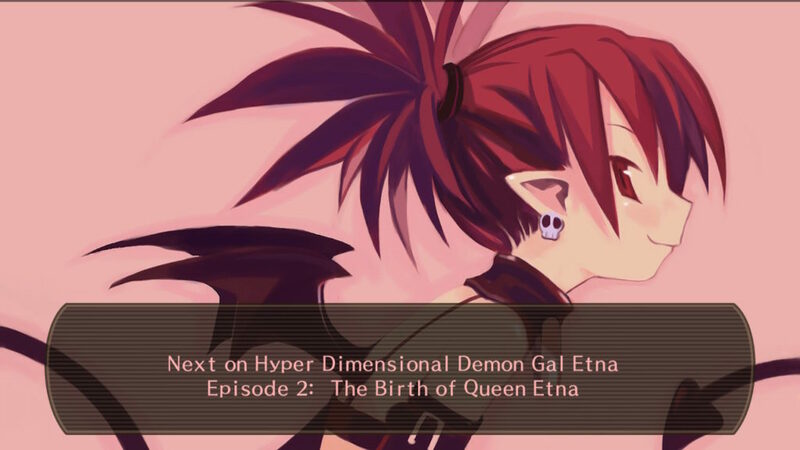 The game starts with our main character Laharl awaking from his two-year slumber, way longer than he intended. He’s woken up by his loyal vassal Etna, who had been using many sorts of weapons trying to wake him. Etna tells him that during his sleep a lot of things had happened, mainly that his dad “King Krichevskoy” had died. This demon world had been impatiently waiting for a successor to King Krichevskoy as he was the ruler of them. Laharl vows to claim the throne and so begins his long quest of many battles and new companions. The story develops further and further after a certain number of battles are won. The game can end early, even with the first boss, if you lose. Which means also your story comes to an end, which is a fun approach and clearly shows you that this game is more serious about dying than most other games. If you want the full story, you need to keep battling on and watch out that you don’t die much. The graphics of this game are indeed an upgrade of its predecessor fifteen years ago. The underground of the battles are still a bit pixilated but still add to the immersion of the battleground because of its form. The backgrounds are beautifully painted and are sadly a minor part of the game. The artists made sure the characters in-game are animated and less static than in other turn-based games, also the world and battlefield are filled with color, which makes this remaster even more wonderful to look at. The game features many songs to listen to while killing away and even though it’s beautiful soundtrack. If you’re spending enough time on a battle or in a certain place it starts to sound obnoxiously repetitive. Pretty much all dialogue is voice acted, even when you’re walking around talking to people in your castle, except for the odd occasions when there is a bit of dialogue mid-battle. (e.g. in the tutorial) The game has a lot of sound effects, from swinging your sword, slamming down on someone with Laharls special move “Blazing Knockles” to the Prinnies (companion monsters that oddly look like penguins) that explode when you throw them. 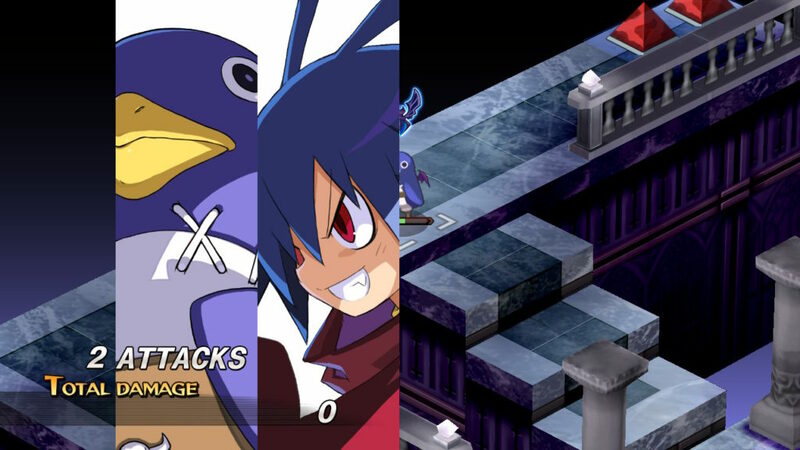 Disgaea 1 Complete is a turn-based tactical role-playing game. Because of this it mainly revolves around its combat scenarios in which you battle against other demons, turn by turn. During your turn, there are multiple actions you can do but the first thing you’ll always do in a new battle is spawning at least one character to go fighting with. With your selected characters you can move, attack, use one of the many items you can collect, execute one of your special skills, pick a friend or foe up and throw someone you’ve picked up. Each character has a set of weapons they can use which defines their attack range. After the battle ends, your party or what is left of it earns experience, which will result in levelling after a while. Another big part of the battles are geo symbols and panels. Geo panels are parts of the battlefield that have a colour overlay and are affected by geo symbols when they are on a panel of the same colour. Geo symbols can provide buffs and debuffs to anyone standing on them or even provide buffs only to the enemies on them which can make them a real nuisance. Some even make all panels of the one they are on change colour when destroyed, which damages anyone on them. Aside from the battles, you can always return to your home base, where you will be provided with any assistance you require. This goes from buying items, healing yourself in-between battles, visiting the music shop, which makes it possible to re-listen songs for your own pleasure or just talking to your vassals. Also when you reside in your base, you will be able to visit the Dark Assembly. Here there are a lot of things which can be done like for example get yourself some higher level allies, which can be created all by yourself. The character that addresses the Assembly will become the mentor and the new character will become the pupil. At first, you will only be able to create characters who aren’t capable of much, this will change when you have more mana to spend. After a while, the pupils will become much diverse because of the wide range of possibilities, classes and monsters you can discover. There is also a possibility to level up your weapons, this can be done in the Item World. The Item World is the world inside all items, there are many troublesome residents dwelling inside the item world, that it might be best to just subdue them. When you want to enter the Item world of a specific item, you need to unequip it first. For each floor you clear inside an item, that item will go up one level, but be careful, this is not an easy task. Monsters inside the Item World are strong and if you aren’t prepared it will cause a humiliating defeat. You can only exit the Item world after clearing every tenth floor, unless you have an item called: Mr. Gency’s Exit, so keep in mind it will be one hell of a ride to level up an item. 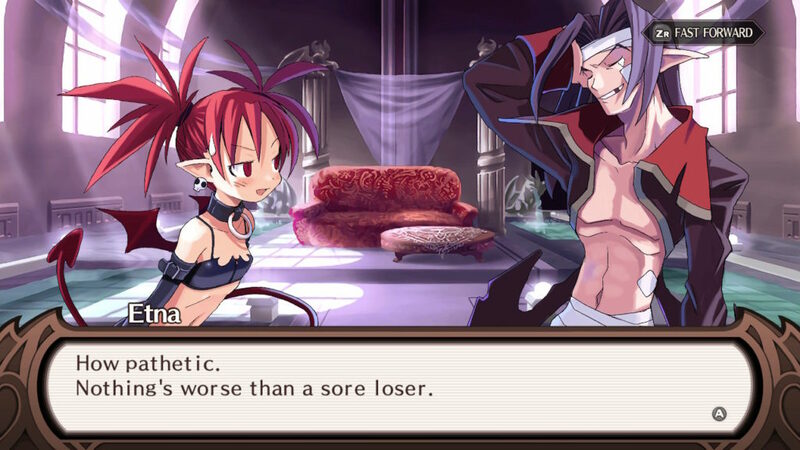 Disgaea 1 Complete is one of the more fun games they remastered in the last few years. It has an in-depth gameplay and some approaches we mostly don’t get in other games. The Dark Assembly, as well as the Item world, are both fun additions to an already very awesome game. Apart from the newly improved graphics and sound, there aren’t a lot of differences with its original. 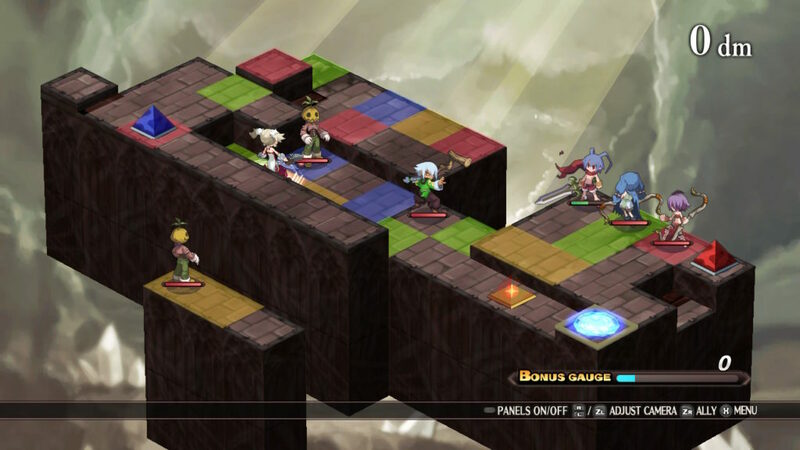 So if you are looking for a new and improved Disgaea with a lot of new elements and stories, this is not the case. But if you are hunkering to play one of your oldies again, go to your nearest store, because some classics like this, we should call ‘goldies’.